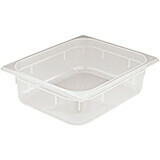 Designed to CEN Gastronorm Standard EN 631-1, Quarter Size GN 1/4. Available from 4" to 6" deep. 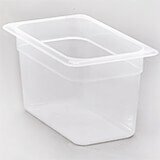 Use these translucent food pans in Cambro Food Bars and Vending Carts. Non-stick smooth interior surface increases yield and eases cleaning. 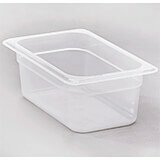 Uniform flange width ensures a smooth fit for prep tables and rails. Translucent Pans are not designed for steam table use. 12.75" X 6.25" X 6"